Dear readers, tonight with me is an unwitting time-traveller. Dragged into a series of hops across time by a mute girl, he tries to make sense of her reasons and the mystery behind the fate of humanity. Oh, I’ve spent most of my life in a mid-size city in Western New York. Tough sometimes for an old man like me. Used to be a really nice building, but now half of the tenants probably have criminal records. They’re always harassing people who walk by the main entrance. It’s a damn shame. I used to walk at night with my wife, God rest her soul, and my dog. Wouldn’t do that nowadays! A few streets over, that’s where you want to live. All these kids came in a few years ago and bought all the empty buildings. Now there’s coffee, food…There’s a British-themed restaurant too! My wife was from Lancashire, not sure if I mentioned it. That’s why we went to London on our honeymoon years back. Anyways, yeah the kids bought up all the property near where the city paper used to be. I worked there until it closed…That’s where we met, Marie and I. She’d just moved here to the states to be a reporter, and I was a record clerk. Of course, that place closed down years ago. People just don’t like papers anymore, I suppose. Well, after Marie passed on and my dog Maverick got off leash and got away, I just mostly kept to myself. I go to that diner over there down the street, have tea and eggs. I work part-time at the library to help pay the bills. Ruth is the Head Librarian. Also my neighbor. Sweet lady, always nice to me after Marie passed. I was just getting to that part. See, one day I met this girl. She bumps into me, doesn’t apologize or anything. Then I see her age outside of the library window. She looks scared for some reason and then just managed to disappear faster than a blink! Next thing I know she’s in front of my building getting harassed by those boys. Not sure if I mentioned them. They live in my building now. Used to be the Marcone’s and Greenstein’s lived down the hall. Now it’s these punks who don’t do anything but bully people. So I hear them catcalling this girl with short red hair and a big leather coat. I see them out my window and hear her yell. I grabbed my coat and went outside and told the boys they best be letting her get on with her business. A minute late, one of those boy pulls a gun! The girl screamed like a banshee and knocked one of them down, and right when the boy is about to shoot, she comes up and grabs me. There’s this bright white light, and suddenly we’re years in the past! At first, I was confused. It took me a moment to realize we were back in time to when Marie was still alive. I ask this Mystery Girl what’s going on, but she can’t tell me. Tried, that’s for damn sure, but she couldn’t get more than one word out at a time without a lot of struggle. So I don’t know who she is or how she did what she did. But she told me we couldn’t see Marie. She took me back to my time. Well being knocked out of time was scary enough, but that was just the beginning I’m afraid! Just when thing settle down, this bi thing appears in my house. Its six feet tall, and so dark that light seems to fall into it. When it appears, my young Mystery Girl can’t do her little trick. The air gets heavy and echoes all around us. It’s like constant reverberation. The longer it goes on, the harder it is the move away from it. That scared me to death the first time that thing came after her. We got away from it a few times, thank God. What else really scared me was this violet eyed girl who kept coming after the girl. She was short, looked like she was maybe from India or Southeast Asia. She was as strong as a bear. No matter how close she got to the black void with the echoes, it didn’t bother her one bit. That girl terrified me! There are two that come to mind. The first is how I got to see just how beautiful live is going to be. Not for me, mind you. I’m an old man now, so I doubt I’ll live to see it. But there’s this point called the third Revolution when we make incredible leaps in technology. The world really gets it’s act together. War, disease, hunger, all gone. They een start venturing out into the solar system. Can you believe that? I remember growing up watching Apollo 11 land. I tell you – if my father had lived to know that’s where we were headed! I lost my two best friends years ago. My wife died and my dog got off leash chasing a squirrel within a few months of each other. Between that and the newspaper shutting down, I just felt like it was over. Of course, Ruth was always nice, and my buddy Isaac – he was a reporter at the paper too, great guy – he went and opened up a bar called Newsies. But as Mystery Girl took me through time, I did make some new friends, too. There’s Calev, Razlen, and this adorable little one named Tal. SHe’s the youngest of the bunch, but just a brilliant scientist, let me tell you. They were trying to find the Mystery Girl. That’s how I met them. Heh, well, funny thing is, Ruth has been inviting me over for tea and snacks for a while now. I finally said yes after all this time. She’s about my age, divorced, you know how that goes. But it was nice to spend time with someone again. Honestly, I never realized how much I hated what I’d become. I knew Marie would never have wanted me to sit around and do nothing after she died, but I just let it happen over time. This whole adventure I’ve been on, it’s at least gotten me to smile and meet people again. Could you talk about the villains? Well, it’s a funny thing, but I’ve learned that can be a somewhat relative term. People fight for what they believe in, but it’s when they start hurting people along the way that it becomes a big problem, you see what I mean? There’s this group in the future called the Mossbacks. That’s what others call them. They don’t like all the advanced technology, or the price people had to pay along the way. They’re trying to stop it. They blew up a computer center, a science lab, lots of things. Hurt peple, too. To make things worse, they alo want Mystery Girl for some reason. What’s your favourite drink? Relaxing pastime? I love to read my books and go to the movies. I’m a sucker for science fiction stuff. Always have been. And in the future I got hold of this gelatinous soda pop. It’s amazing! But since I’m not the one who does the moving about through time, I’m happy with my Earl Grey tea. Hopefully a bit of rest! But I hope to see that Mystery Girl again. I never had any children, and have no siblings. We only spent a short time together, but it made me feel like that’s what it would have been like to have a child. As far as I know, Mr. Sanderson has an idea for a second book. He’s toying with calling it the “Echoverse.” A Footstep Echo was broken up into three parts. Next time he might do five! If I go along for the ride again, I hope there’s a bit more downtime planned. I’m worn out! Sometimes I still wish I was off hopping through time. Don’t tell Ruth! But I do miss my new friend. I used to wonder to myself “Who is the Mystery Girl?” Now that people know, lord only knows what is in store for us all. J.D. Sanderson lives with his wife, daughter, and mini poodle in South Dakota. A lifelong fan of science fiction, J.D. has been writing professionally in one form or another for seven years. When he’s not writing, you’ll find him enjoying his favorite sci-fi movies and shows with his family or walking his dog. 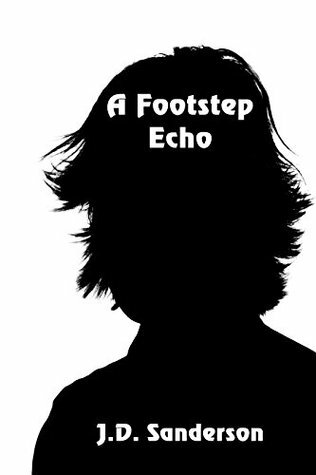 You can find Bernard on the pages of A Footstep Echo. Join us next week to hear from a major in the Commonwealth Space Marine Corps. Please follow the site by email (bottom-right) to be notified when the next interview is posted.